Participants at Central Saint Martins and live stream. 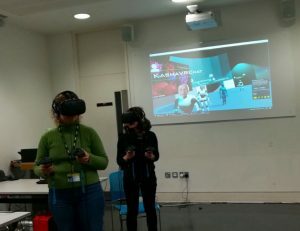 It was Central Saint Martin’s first ever symposium in VR, and the excitement was more than palpable – it was embodied in real and virtual space. 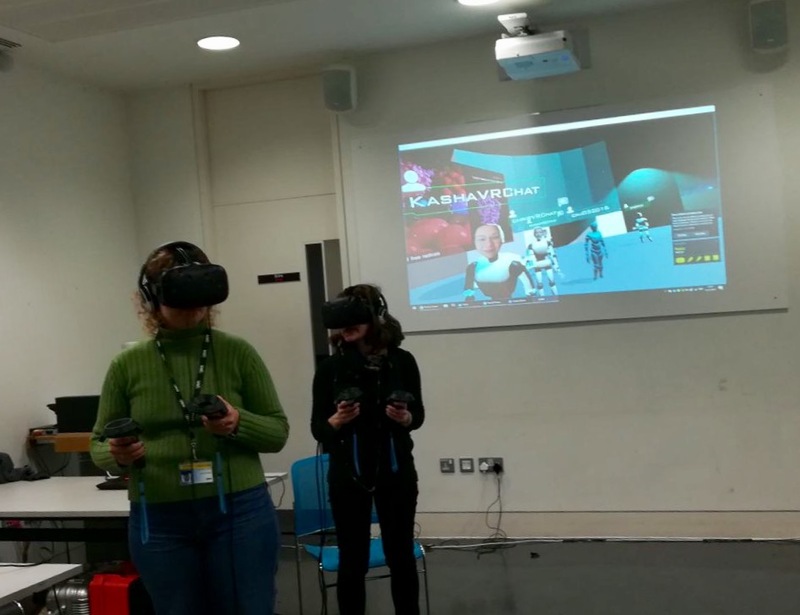 The program was hosted by the MA students in the Arts and Cultural Enterprise program (MAACE) in partnership with UAL’s Digital Maker Collective and was developed as a prelude to Tate Exchange 2018. Many of us in attendance were the participant-learners who had conceived of and contributed to the space. 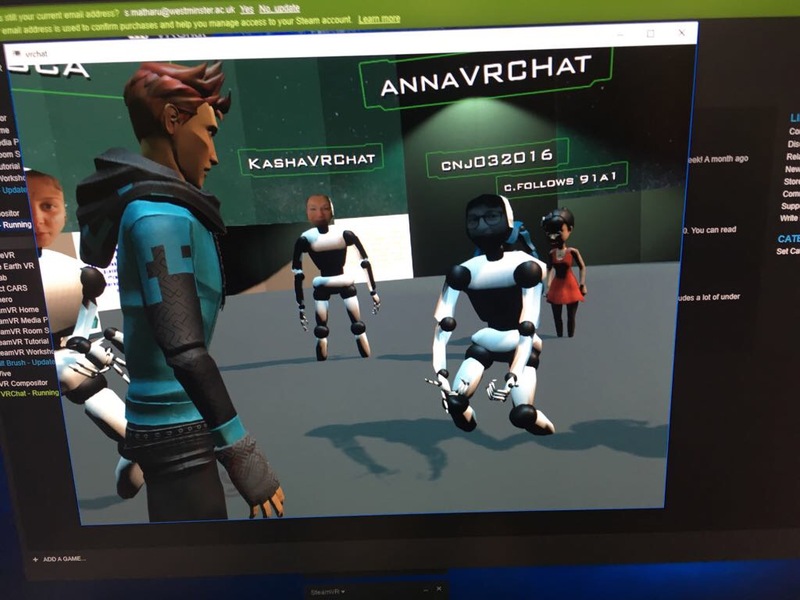 We are students in CSM’s first accredited distance-learning program, and we connected across continents via WhatsApp texts, Skype conversations, SLACK threads, VRChat and in-person workshops to plan this event. Our enthusiasm, unencumbered by physicality, was as expressive and experimental as the technology itself. Our guest speakers were Dr. Pete Rive, lecturer in Creative Technologies at Auckland University of Technology, and Savraj Matharu, faculty from Westminster School of Media, Arts and Design. 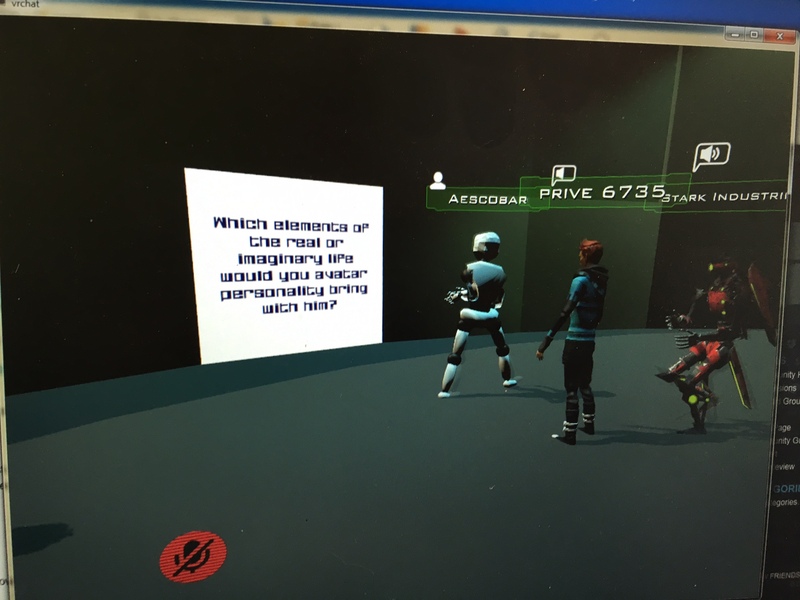 Rive and Matharu discussed with our group the potential of VR as an educational medium. 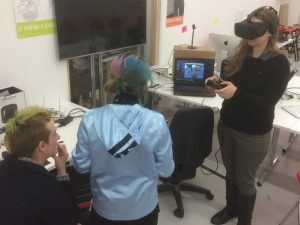 In arts education, VR functions as material for collaboration, and the collaborative output is also the educational setting. 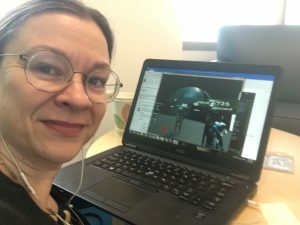 VR’s fluidity of function results in emergent learning for students and educators alike, which creates academic relationships that are more dynamic than in a traditional cla ssroom or workshop setting. This idea led us to explore, conversationally, the psychology of embodying an avatar. 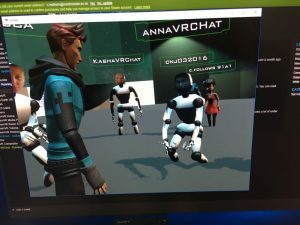 Frequent VR users may have multiple avatars with different personalities. This phenomenon also has potential to impact educator/student relationships. 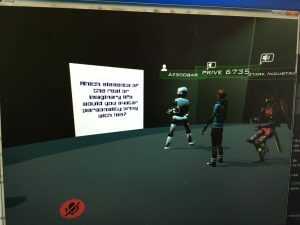 Matharu shared that students who are active gamers tend to relate to the educational VR space as though it is the same as a gaming environment. The gamer perspective could be leveraged to incentivize learning, but it also has the risk of trivializing the educational experience. Just as it is possible to embody different avatars in VR, the possibilities for new worlds are endless. Rive described student-created worlds that are based on genres, such as horror, science fiction, or comedy. Students invite audience members to engage in their genre world, and then map the audience experiences into a narrative. So, the students evolve from designers to documentarians and from architects to storytellers. Participants from Digital Makers Collective at Chelsea. The rich conversation continued for nearly an hour, with examples ranging from digitized choreography in VR to virtual tourism and ecology. Our enthusiasm never waned. As we glided and bopped around the space, we clamored to share ideas and ask questions even in the last few minutes of the program. We’re looking forward to the next iteration at Tate Exchange 2018. And we’d love to hear about your experiences in VR. Comment here or join us on the 5th floor of the Tate Modern, 5th-11th March 2018! Special thank you to Anna de Amicis, symposium instigator and project manager; Chris Follows, Digital Maker advisor; Alejandro Escobar, VR designer; Tim Morgan, online exhibition advisor; Emma De Angelis, program facilitator; Charlotte Bonham-Carter and Andy Marsh, co-course leaders, all of the ACE Connectors; and of course, the MAACE VR Symposium team that made the magic happen, Irene Del Principe, Enrica Franca, Kasha Frese (author of this post), and Jonathan Swain.